A 5n1 Twin Racing Combo so your kids can jump, climb, basketball hoop and slide their way to fun! This unit can be used wet or dry, if used wet it has a pool at the bottom of the slide. This combination Bounce house and slide is great for any party. 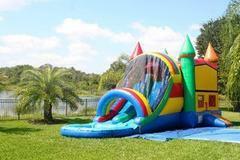 15X15 Bounce area 9 ft tall slide and length is 35 feet. WE HAVE DIFFERENT THEMES FOR THIS BOUNCE HOUSE CALL AND ASK spiderman, happy birthday, princess, monster truck, racing, and many more!